Over at Home Depot, this new Husky 12V 3/8″ cordless ratchet set dropped in price to $49. It debuted last month at $99, and my guess is that they’re trying to clear them out of stores before the end of the year. The ratchet features a built-in Li-ion battery, and comes with an AC charger. It operates at up to 230 RPM, and can drive “240 fastener cycles per charge.” It’s rated to 30 ft-lbs of torque, and can be used in “manual” mode for up to 150 ft-lbs of torque. 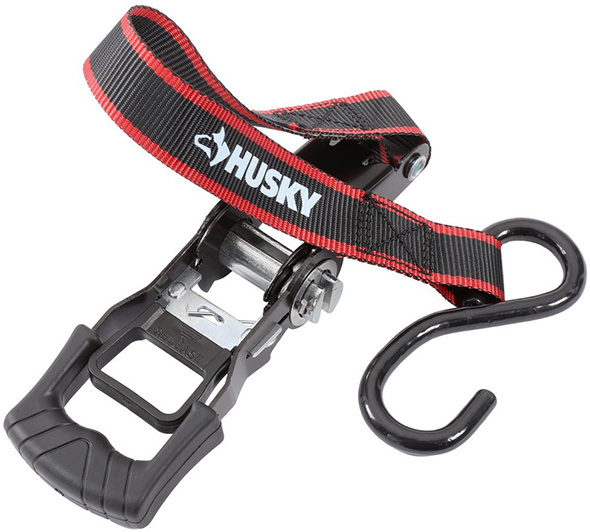 The Husky kit comes with a selection of inch and metric 6pt sockets, and it all stores in the included blow-molded case. Charging time is 90 minutes. There’s a battery fuel gauge on the handle, and also an LED worklight. This tool has been on the market for less than a month. As such, there’s not much feedback yet. At $49 for the kit, it doesn’t seem like a a big risk. P.S. If you bought one at $99, be sure to ask Home Depot for a price adjustment. From the UPC (037103326850 – if I’m correct) the OEM/Source is the Apex Tool Group. While I’m not a fan of tools with built-in batteries – going this route does keep the price down. The downside is that when the battery fails to take a charge – you probably will opt to dispose of the tool – rather than open it up – then try to find a replacement battery. agreed but considering the costs of the other devices like this on the market it’s a hell of a deal. Even in if it breaks in a few years. I’m assuming DIY use not pro use. I’ve toyed with getting into the milwaukee battery line for their ratchet – since it’s still cheaper than me buying the MAC tool version and some DEWALT 12V batteries. The old skil ratchet like this wasn’t bad. I used one for a long time when noone else offered one. If batteries are a concern buy two. The “buying two” idea may work if the battery life is a strong function of the number of charge-discharge cycles rather than shelf life. Then you could hold onto one as an unused spare. But if shelf life is a big driver on battery life then both tools may fail at nearly the same time after purchase. That’s not to discredit this tool as an inexpensive alternative to its M12 and other cousins that will cost you more. 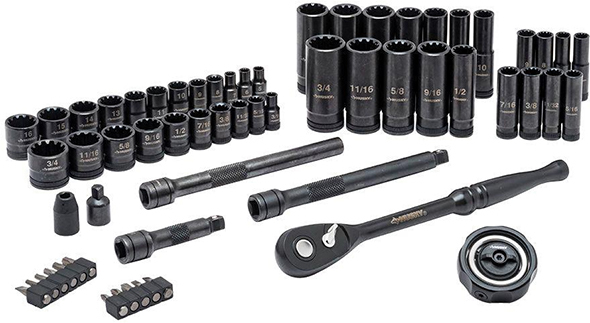 Furthermore, depending on how much value you assign to the socket set – if the ratchet performs decently $49 for the combo is pretty inexspensive. 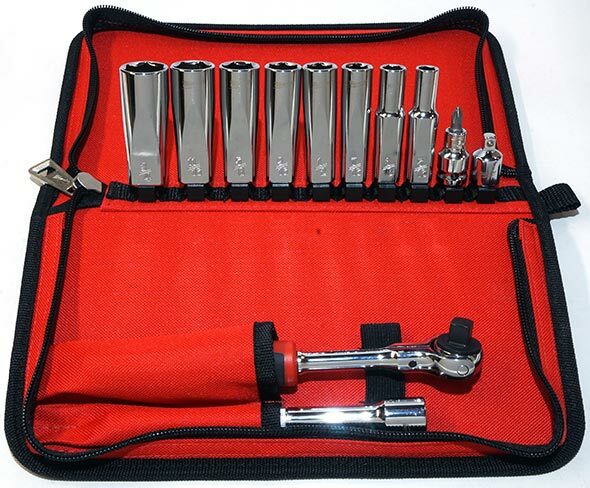 Weird – why would they package 1/4″ drive sockets with a 3/8″ ratchet? There’s apparently 10 in stock at my local HD. Must be a really poor seller. They do include an adapter. My guess is that the sockets are all or part of some other homeowner set that comes with a 3/8″ ratchet. Only 8 of 35 sockets are 1/4″ drive. 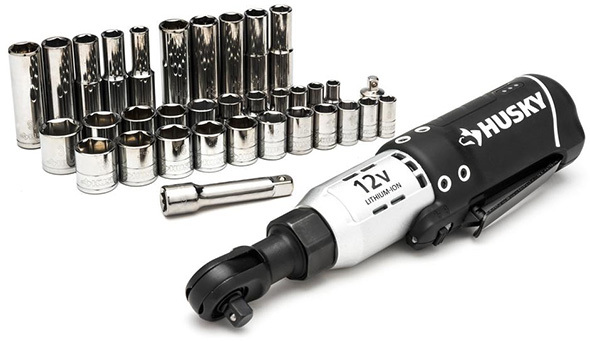 Which of course should be since they’re the smaller sizes used ….the rest are 3/8 drive..it’s actually a very good deal at $49..
Years ago Skill Tool put out a 1/4” lithium Battery Ratchet and I used a 1/4”- 3/8” adaptor on the end. I cannot remember the torque or the voltage but I used it in my line of work assembling and disassembling store fixtures. The switch eventually became erratic although the tool still worked fine as far as battery charging etc. Finally the switch went out completely. HD clearanced these out along with some Skil Cordless Screwdriver that came out the same time as the Ratchet. I was fortunate enough to find the display model on clearance for like $5-$10 and purchased it as I already had the charger. I now used the Skil Ratchet only for DIYer usage but eventually the same thing happened ie the switch went bad. A couple of years later I found Milwaukee M12 version 3/8” drive and purchased it. Love this tool! I have not upgraded to the brushless version of this Ratchet becuase the head of the tool is double the size and although it has more torque I believe the larger head limits access in a lot of areas. I try not to purchase any cordless tool without a replaceable battery but if this tool drops again below $50, I will probably purchase it for a backup. Yeah, cordless tools with built-in batteries aren’t really a good idea unless you just want it for disposable use. Really would be nice if Bosch came out with cordless ratchets for their 12V Max line. I think all the manufacturers have just given the 12v line to Milwaukee. Originally I purchased the Milwaukee M12 but they had battery issues initially ie the batteries would quit taking a charge after 6 months or so. Then I switched over to the Dewalt as they had the L type battery and the tools could stand on end plus the ergonomics were awesome. Dewalt apparently have quit developing more tools for the 12v lineup so I switched back to the Milwaukee a couple of years ago and have at least a dozen or more of the various M12 tools. Haven’t been disappointed! TTi is going all-out both with the Milwaukee and the Ryobi brands, there’s an amazing number of cordless tools for their platforms. I still like the 12V (and 18V) Bosch tools better, even though they have a lot of similarities to their counterparts in the Milwaukee line. I guess Bosch is just concentrating on other areas of their business besides tools these days. Sure would be nice if they’d expand heavily on the 12V brushless tools and given Milwaukee some competition. would be cool if they could add the chisel only option to this package as well. That’s the only thing keeping me from buying one. Those have been around for at least a couple of years. There is also a fuel version. There was no way this was going to sell, at the original price point. It was the same price as the original M12 3/8″ ratchet with a battery. I did notice that the price was dropped to $69 last week, even that was to close the M12 so this is a better price point. Although, technically, they are buying a new battery platform. Just one that is very limited. I got one…what the heck $49. I will wait for the newer version of the m12 to come in a kit….but for $49….Not even the price of a Steak at a mid-level steakhouse. What is a fastener cycle in relation to a ratchet? Is that 1 complete 360° revolution of the ratchet turning a bolt thread? There’s single bolts that have 240 threads or more in the pitch. How many fastener cycles will it have if you have a rusty bolt or a tight fit and have to apply more torque than what the electronics can provide? Wouldn’t that be the same as using a normal ratchet if it requires manual torque? So I honestly don’t see any beneficial purposes to using a battery powered ratchet due to very limited electronic operation and torque. Why would I want to use this as opposed to one of my air ratchets if I don’t want to use my manual ratchet? As long as my compressor is running I have unlimited fastener cycles and I can adjust the torque. I assume these weren’t made for automotive use. So what are they made for? I have not turned on my 80gal compressor in my garage in about 2 years besides to use my air chisel a couple times. Between m18 1/2 impact, 1/4, and the various M12 tools I’ve had no need. Its so nice to not have to screw around with a hose. I cant speak directly about the Husky impact, but my standard m12 (not brushless) is much less torque than my air ratchet. Still worth it. Every mechanic where I work has made the switch to battery powered everything besides one old timer. This includes in shop work and road techs. The exceptions would be airing tires and rivet guns. With Milwaukee’s rivet gun coming out (or out) its going to be the next thing to go. I’m seeing in automotive now what I’m sure a lot of people on this board had seen in construction – a switch from corded to cordless. Its actually pretty exciting. I think in tight area’s where higher torque is needed air tools will still be needed to get jobs done. Cordless is great when there is plenty of room around the bolt but that is not always the case with auto’s. If I’m working in a space that is extremely confined I can make it work with the drawers upon drawers of varying shaped ratchets/wrenches to break it loose then switch. Have you had a chance to use the m12 stubby 1/2 (or 3/8)? 250lbs of break loose torque it is probably my new most used tool. Must only be 4-5″ long. Great for about 90% of what I do. I didn’t throw out my pneumatic tools but have not found a need to use them in quite some time.